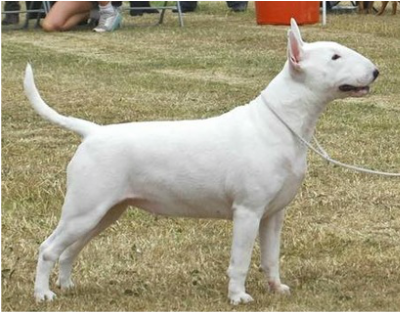 It was an honour and privilege for me to award my first set of CC’s for The Northern Provincial Bullterrier Club, the show was very well run and for that I would like to thank my stewards and the committee. Thank you also to all the exhibitors for entering and exhibiting therefore giving me the chance to go over some excellent Bullterriers, I thought the quality was very high and wasn’t at all worried about the mouth faults of a small number of the exhibits, which consisted of instanding canines, and minor mouth faults. Generally conformation was good and all of the dogs were in good condition. 11 ½ months upstanding white with super bone, substance and tight cat feet, good strong head with turn and fill, neat ears and perfect mouth. Straight front a little long cast and loose in body but still only young and needs to mature. Moved ok.
14 months white with red ears, head filled and turned, wicked eye, mouth ok, ears well placed. Good reach of neck into well placed shoulder, good round bone, short backed, level topline, well bent stifles. Moved well both ways. 15 months white with black ears, good head correct bite with 1 instanding canine, deep forechest, well laid shoulder, short backed, well made throughout, moved well both ways. Handled and presented well. 18 months white with tricolour head markings, nice head which has good turn and fill, perfect mouth, well made throughout and moved accordingly, handled and showed well. Large upstanding white of 22 months with super bone and substance, strong head which just lacks a little fill under the eyes, good mouth. Nice neck into well laid shoulder, level topline and good rear angulation. Moved really well with great drive from behind. 2 years black brindle and white, very typy dog, powerful head with good turn and fill, correct bite with 1 instanding canine. Straight front, and lovely forechest, good lay of shoulder and level topline, well angulated quarters, moved well both ways. 3 years upstanding well marked brindle and white, good head with turn and fill, perfect mouth, well placed ears, straight front with good lay of shoulder, short backed with well angulated quarters, to be critical would like to see him carrying a little less weight, covered the ground well. 9 months white with head markings, upstanding typy puppy who has a lovely filled and turned head, wicked expression and good mouth. Nice neck, well made throughout just needs to mature, moved well when settled. 6 months Dark brindle and white, small compact well made puppy. Head has turn and fill, mouth fault. Ears bang on top. Good bone for size, moved and showed well once settled. 16 months white with ear markings. Head has good turn and fill, good expression, lovely underjaw and perfect mouth. Carrying too much weight which makes her look stuffy in neck, well placed shoulder, straight front with good bone, and well-made throughout. Would like to see her considerably lighter. Moved ok.
13 months tricolour, good head with clean profile, correct mouth. Well-made throughout and moved accordingly. Well handled. 18 months white with eye flash, head has good turn and fill but is slightly browy, good mouth, well placed ears. Good neck and shoulder, well-made throughout and moved well both ways. 18 months well marked red and white, head is filled but needs slightly more turn, good ear set, lovely length of neck into well placed shoulders, good topline, and lovely bend of stifle, moved, handled and presented well. 18 months all white, beautiful head which has fill and turn and great expression, well placed ears, perfect mouth. Straight front, lovely feet. Good lay of shoulder and well made through out, therefore moved accordingly. Very well handled and presented. 2 years well marked red and white, compact feminine girl who has a beautiful head, super expression and perfect mouth. Straight front with good forechest, feet could be tighter. Short coupled, level topline, moved well both ways. Handled and presented well.